Many recipes you come across will call for rubbed sage. This is, quite simply, dried sage leaves that have been rubbed into a fine, fluffy powder. It can be used as a substitute for ground, dried, or fresh sage, and it's very easy to make yourself. Whether you have a sage plant in your herb garden or simply have fresh sage leftover from the market, you can easily transform it into rubbed sage. It can be stored and used for up to one year in any recipe that requires sage. The English, with their fondness for daily, use sage in a specialty cheese known as sage Derby. Following their lead, try adding a few fresh sage leaves the next time you make a grilled cheese sandwich with cheddar cheese. The English also like to use sage with sautéed onions. Try tossing some fresh sage into caramelized onions, then use the mixture to top a pizza. In Germany, sage is often used in sausages. A mixture of sage and caramelized onions as a garnish for grilled sausages proves to be delicious. In Italy, sage is often used in saltimbocca and osso bucco, and is also a great fit with buttery pasta. Rubbed sage is a light, fluffy powder produced from the dried leaves of the sage plant. It is a popular way to use the fragrant herb in recipes and is found in many Italian and Greek dishes. You will also want to add rubbed sage to your holiday turkey stuffings and rubs. It is also fabulous on chicken along with oregano and thyme. Rubbing sage releases the herb's essential oils and turns dried sage into a much more flavorful ingredient. At the same time, the flavor is less concentrated than ground sage, so you'll need to adjust quantities when using rubbed sage as a substitute for ground sage in recipes. 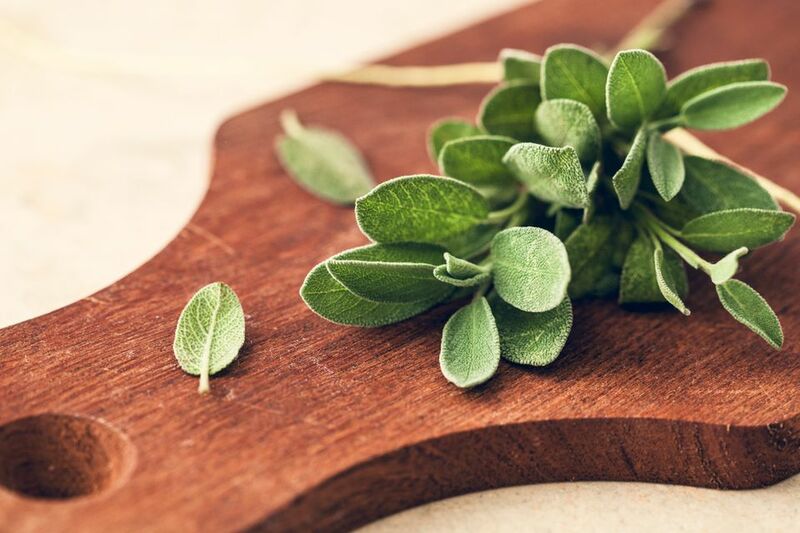 Rubbed sage can also replace fresh sage leaves. Use twice as much rubbed sage when substituting it in a recipe that calls for ground sage. 1 ounce (2 tablespoons) rubbed sage can replace 1 cup of fresh sage. In your garden, pick as many sage leaves as possible, as they will shrink in size considerably when dried. It is best to pick herbs in the morning after the dew evaporates because this is when they produce the greatest quantities of essential oils that contribute to their flavor and aroma. Choose unblemished leaves if you can, but remember that you will be breaking these leaves into a fluffy mixture. A nick or two won't even be noticed, but avoid any leaves that look spoiled. Rinse the cut sage under water and lay the stalks out on paper towels until all moisture evaporates. This will remove any bugs, dirt, and dust the plant picked up in the garden. Before you can make rubbed sage, the leaves must be dried until they are nice and crispy. This can take anywhere from a few hours to several weeks depending on the drying method you use. Other factors that affect drying time are the amount of moisture in the leaves and the humidity in your home. If you're in a hurry for rubbed sage, choose a fast drying method, such as drying them in the oven or using a food dehydrator. But if you can wait, hanging the sage to dry is one of the best ways to retain the herb's full flavor. Oven-dried sage: Remove the sage leaves from the stems and place them in a single layer on a baking sheet. Heat the oven to the lowest possible temperature and bake the sage leaves until crisp. This should be around two to three hours but check on the progress often. Food dehydrator: If you have a dehydrator, this is preferred over the oven method. Don't dry other foods at the same time you are drying sage, because they can be infused with the strong sage aroma. Place individual leaves in a single layer and check them often until they are crisp. Sun-dried sage: Because you'll be producing a fine powder, color fading from the sun is not an issue, so sun-drying your sage is a viable option. This method can, however, take anywhere from a few hours to a few days. Lay sage leaves or full stems out on a paper towel, brown paper bag (without ink), or drying screen, then place them in the sun until crisp. Hang sage to dry: A preferred method for many culinary herbs, hanging sage is very easy, but it does take the most time (four to six weeks on average). Bundle about five long stems of sage together and tie the ends with a rubber band. Hang the herb bundle upside down from a nail or bend a paper clip into an "S" shape to form a hook. Allow the sage to dry to a crisp before removing the leaves. Some gardeners like to place paper bags over the ends of their hanging herbs to keep the dust off. This is a good option, but sage does look great in the home while it's drying, so feel free to find any spare nail or hook to hang it. If you do opt for the brown bag trick, secure the bag with a rubber band and poke holes in it to ensure proper air circulation. After your sage is completely dry, it's time to rub the leaves into a fine powder. You can use your hands alone, but it's much easier use a colander or fine mesh strainer. The colander will catch any stem pieces so you won't have to pick them out by hand. The goal of rubbing sage is to transform the dried leaves into a fine powder. It is extremely easy and a very fragrant task that will make your kitchen smell great. Place your colander or strainer over a large bowl to capture all the sage dust. Place the dried sage leaves inside the colander. If you have a lot of sage to rub, spit it into manageable batches. Using your fingertips, rub the pile of sage leaves into the bottom of the colander. This will grind the leaves into a fine powder. The light and fluffy sage powder will drop through the holes of the colander and into the bowl. Continue rubbing until all of the sage has broken down (you may be left with stems in the colander—simply discard those). When you've processed all the sage leaves, the powder should be stored right away. Pack it into a glass or metal jar with a tight sealing lid—this is the perfect way to recycle old spice containers and clean condiment jars. The rubbed sage will store for up to a year, which is perfect timing for your next sage harvest. As with any herb, discard any old sage after a year, as it will lose its flavor after that time. The discarded powder can be added to your compost or simply spread out in the garden or yard. The flavor of rubbed sage intensifies when frozen. Use it sparingly if you are making something like a homemade sausage that will go into the freezer.